There are a lot of ways to get food into your face. A fork, for example, is pretty classic. But forks don’t taste particularly good, and they can hurt your teeth. So we move on to things like fingers, which can be a mess, and again, painful. But bread and tortillas are pretty handy. So is lettuce. I forget about lettuce wraps sometimes. 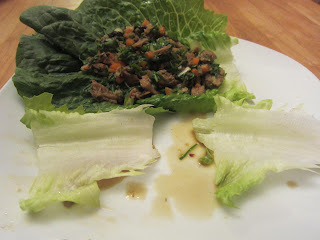 Lettuce wraps are ideal for spring, I think, because they give you a vehicle for moving food from plate to face without overwhelming whatever bright fresh flavors are in your dinner. Plus, the lettuce is pretty good right now. Also, everyone I know is getting married right now. Friends were married this past weekend and more friends will be married this coming weekend. This happened a hundred years ago too, but I was part of everyone then. Now, it seems like every other week someone is announcing an engagement or having a wedding. 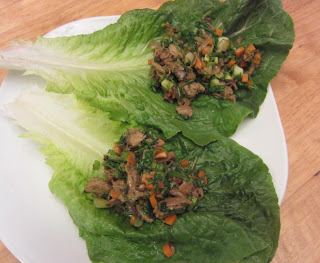 The first time I had lettuce wraps was on my honeymoon, a hundred years ago, in some fake-fancy themed restaurant in Las Vegas. So maybe that’s why we went for it tonight. I think it was Sous Chef Brian’s idea. 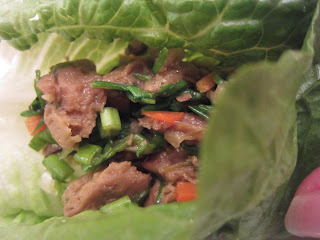 These are seitan lettuce wraps, and they’re vegan and delicious, but you could do the exact same thing with chicken and please the meat people. It’s also – like an egg roll, or a lasagna – a great way to use up whatever’s hanging around the fridge. 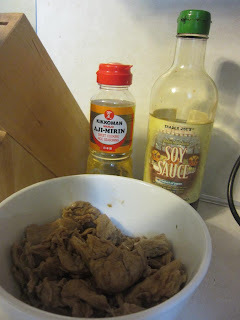 I started by marinating my seitan. You could so whatever fun sauce comes to mind, but this is just tamari and mirin, equal parts. Let that sit and get to the veg. 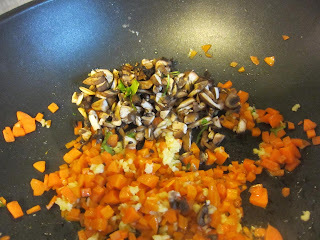 The veg go in order of cooking time, because we’re stir frying and some things need more time. I have carrots today, so they need a head start. 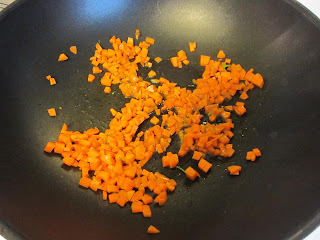 Carrots, diced small, in a tablespoon of oil (I used safflower, but use what makes you happy), over high heat. 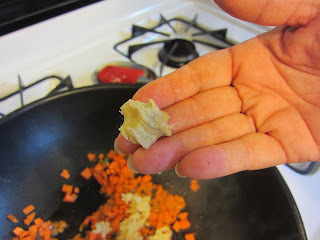 Give them a minute to soften, and just a minute, and dial it down to medium and hit it with some ginger and garlic. What other veg do you have, and how long do they need to cook? If it was bell pepper time, some red peppers would be great, again, minced small, but really, what you have will be great. 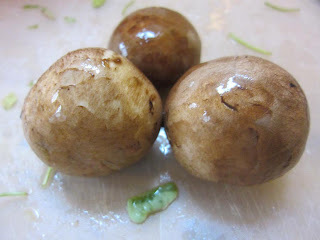 I had a few stray mushrooms, and some claytonia, and scallions (there has to be some sort of onion, I think). 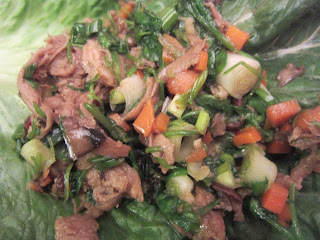 The claytonia just needs to wilt, and the scallions go on at the end, so I added my seitan and mushrooms. The marinade from the seitan went in too, and I used a spatula to hack at the larger pieces of seitan. I wasn’t aiming for minced, but this had to fold neatly into lettuce. I added the claytonia. It subbed well for sprouts, but sprouts would be great here. 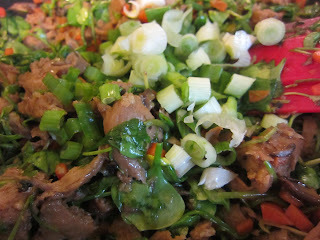 Flipped that a few times to wilt, and then turned the heat off and added the scallions. Also, a quick drizzle of toasted sesame oil and a sprinkle of red pepper flake (to taste). That’s it, all you need to do now is wash and dry some large lettuce leaves and make it a taco. Last week I had some awesome local bibb lettuce, but this week all I had handy was spring mix and spinach, so I sent my spouse out to The Grocery Store and the best they could do for us was romaine. Romaine is fine, way better than spring mix, for this, but if you can get some butter lettuce or bibb, you’ll be doing alright. Pro tip: If you are using romaine, break off the crispier stems and you'll have a much more foldable wrap. 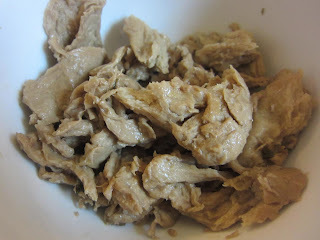 Marinate seitan in mirin and tamari while prepping veg. 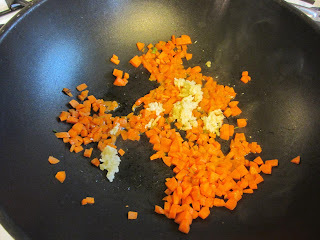 Heat oil on high heat in wok, add carrots and stir fry a minute until they begin to soften (longer for larger carrots). Turn to medium, add garlic and ginger, and toss. 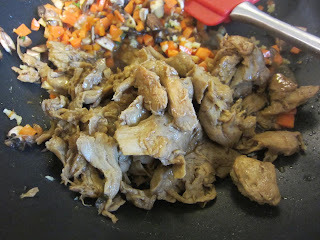 Add mushrooms and seitan, breaking seitan up with a spoon. Toss. 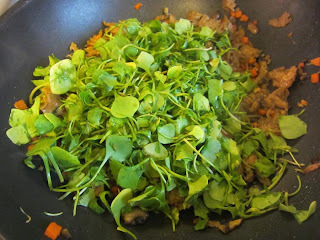 Add claytonia (or sprouts, or greens) and toss to wilt. 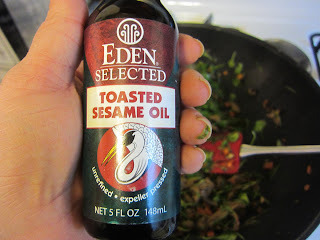 Turn heat off and add scallions, red pepper flake and toasted sesame oil. Toss. Wash six large lettuce leaves and dry. 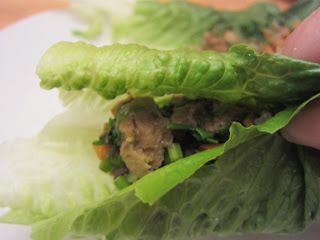 Serve hot seitan mixture on leaves, wrapping like a taco.